I never believed that such complex life lessons can be explained so short and simple. Yes, this best-seller is just 96 pages as anyone could finish it in an hour. It’s been 20 years since the first print, still it has it’s own space in the genre of self-help and personal development, with over 15 million+ copies world-wide. It starts with a group of friends meeting up after their high school reunion. One of the friends begins to tell the story of "Who Moved My Cheese?" and at that point the author begins to describe, symbolically, the manner in which so many people in this world deal with change in their lives. 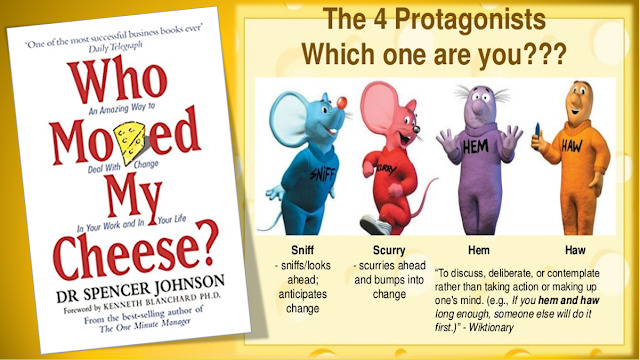 Four characters (Sniff,Scurry,Hem and Haw) live in a maze and look for cheese to nourish them and make them happy. The maze is where you spend time looking for what you want. It may be the organization you work in, the relationships you have in your life, or the community you live in. Sniff and Scurry are mice; they represent parts of us that are simple and instinctive. Hem and Haw are the little people, representing those complex parts of us as human beings. Sometimes we are like "Sniff" - who anticipates change early by sniffing it out, or "Scurry" - who quickly scurries into action and adapts. Or we are more like "Hem" - who denies change and resists it out of fear, or "Haw" (yes, that's the name😁), who learns to adapt in time when he sees something better. Cheese being a metaphor for what we want in our lives (everyone has their own definition for what cheese means to them) and we all go after it because it makes us happy. 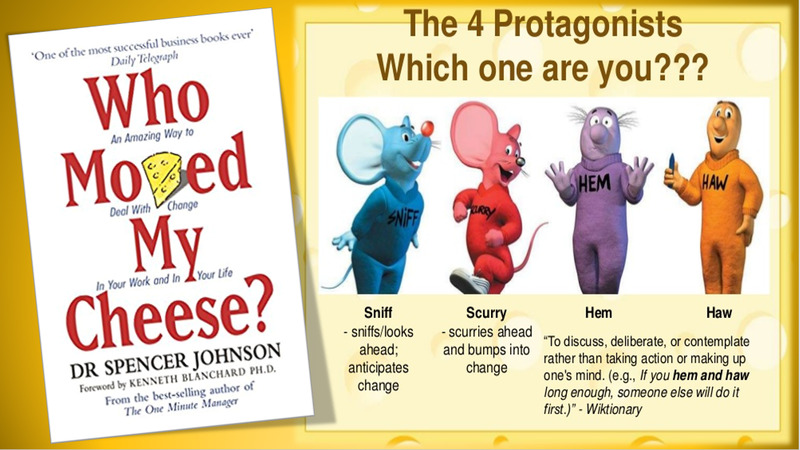 The maze in the story represents where we look for our cheese or happiness. Our cheese is always changing and you should not get comfortable in relying on our cheese to always stay how/where we left. Whatever part of us we choose, we all share the common need to find our way in the maze of life and succeed in changing times. Eventually, like "Haw" sometimes we learn the great deal of handling with change in our life and work. It's really worthy & quick read at just 96 pages, and it addresses life changing principles that can greatly alter our degree of satisfaction in life. 20 years since it's first print and it still running strong it seems. This book has yet to grace me with lessons but I do look forward to it. Great review of one of my favorite books of all time. As you say, if all life's complexities could be boiled down like this, life might make a little sense! The book is best, but there are some fun free animated youtube versions out there as well, definitely worth sharing. Enjoy! I need to check this one out! Thank you for sharing. We did this at one of my jobs as a training session. It's was very entertaining.